What mobility aid helps you to get around? 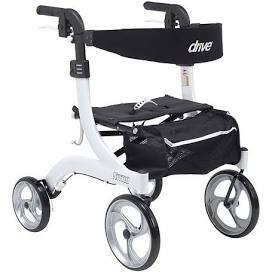 Home Forums Durable Medical Equipment What mobility aid helps you to get around? This topic contains 7 replies, has 3 voices, and was last updated by Debi Wilson 2 weeks, 4 days ago. My son and daughter in law gave me a voucher for Christmas for a walker . I picked this one, and I love it! What do you use to help keep you mobile? What are your mobility aids of choice? Drive nitro euro walker. Yes, I should have mentioned it’s super easy to fold, and can slide in behind the front seat. There’s a pull handle on the walker seat. Just pull up and it folds. I have two but only use one as I find it more steadier and solid, Trust’s Lets Fly, and the one I use Access TGA Active, both are 4 wheeled and both have larger wheels at the front. The larger wheels really help don’t they Jackie. I notice them especially being outside and for making turns. so much better ! Yes they certainly do, plus I would never trust a three wheel rollator. Debi, what i like about our rollator’s are that they dont have those ” ugly ” sticking out to the sides, brake cords, I really dont like seeing those on show. Yes! My last walker had those brake cords. They would get caught on things and one eventually broke! I just got the Drive Nitro rollater, tall, and absolutely love it. I went to my local mobility store to see what aids would be available in the future, you know, for when I need it, thinking this was purely a fact finding excursion. I currently used a cane but was noticing my shoulders and neck muscles were getting tired which told me I was employing more muscles to maintain my balance than I thought. As soon as I tried the rollater I was able to walk faster with much less effort and I realized the future was now! I went home and couldn’t stop thinking about it and knew I had to buy one. Drive has come out with a new model called the Nitro Duet which has foot and arm rests so a caregiver can push you in it while seated. It’s called a rollater/transport chair. I was going to get it but it was on back order and I didn’t want to wait and figured I could always get later. That is awesome! Thank-you for sharing your story. I will check out the new Nitro duet you mentioned, it sounds great!